About Me: DogBreedz Greeting Cards - in celebration of your favorite breed! I am an internationally recognized pet photographer, with dogs being my specialty. As a strong supporter of animal rescue, I regularly participate in fund-raising photo shoots, including a National Photo Tour across US. My love affair with photography began many years ago, starting with High School Sports photography. My interests soon evolved to urban landscapes, with my Alley Art series being featured in shows throughout the United States. My other love lies with animals, especially the Canine world - and I have found a happy merging of the two. I currently freelance and am a contributing photographer for Dog Fancy Magazine and Brown Trout Calendars. I am happy to be "owned" by two rescued Cocker Spaniels, Indie and Bennett - you'll likely see their photos here as well - they are very willing models for their momma! I shoot with a Canon 5D. Love it! Cards cost $3.00 each - order only 5 or more for bulk pricing! Click HERE for details. Do you love the images here? Get them on Gift Items and TShirts! Visit my Zazzle Store for more options featuring my orginal photography and graphic art. Have fun! - three "Thank you, Groomer!" greeting cards, featuring an enthusiastic dog on the front. Inside is blank for your customization. Today's added breeds: Scottish Terrier (brindle), Cocker Spaniel (buff) and Lakeland Terrier. ... as with all my cards, you can easily add/change the inside text to anything you choose when ordering. Enjoy! - seventy-six new Friendship Day cards, designed in distressed turquoise and shades of black with just a hint of bubblegum pink. Front of card features your favorite breed and the words "Friendship Day" Inside of card reads: Friendship Day is the perfect time to tell you how very glad I am that YOU are MY friend ... on every day!" Today's added breeds: too many to list - come take a look! ... as with all my cards, you can easily add/change the inside text to anything you choose when ordering. You can also contact me for changes to the Front of Card text or to request another breed. Enjoy! Welcome to the DogBreedz Greeting Card store! Here you will find some of my favorite photographs on handsome cards, suitable for any occasion. I specialize in pet photography, but you'll find a few of my non-animal images here as well. Many of my cards are presented to you with blank insides - if you desire you can customize them yourself at no extra charge. There are plenty of fonts, font sizes and colors to choose from to make them your own. Try it, it's easy to do. Order some for yourself, order some for friends. You can even order just one and have it sent directly to the recipient (the postage is the same as if you sent it yourself). Come on in, enjoy the views - and please, don't mind the dog hair! 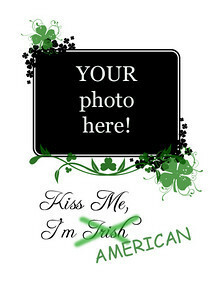 Valentine's Day and St. Patrick's Day 2012 - Your Photo Here! 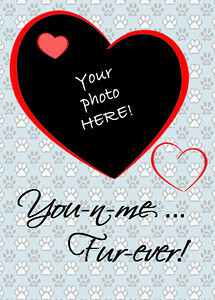 Request a favorite breed for a custom card, or you can use YOUR photo for the truly personal touch - all at no additional charge! Inside text of all cards can be easily changed by YOU during the ordering process! 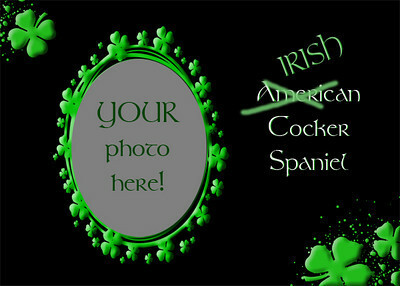 The nationality in the St. Pat's cards can be changed by the artist for you. To contact the artist, click on the paint palette icon, found under the thumbnail of any card below or use the "Contact This Artist" link above (just under the Holiday Banners). Dog lovers everywhere must love your store! Hi Peggy, so many great photo's... My goodness and all so great. Hi Peggy..... Awwwwww so cute! Awesome cards and wonderful photography! Really can't help smiling while I browse through it! Well done! 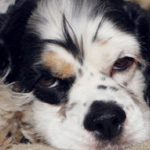 So great information on your blog and as usual; GORGEOUS dog photos! Congratulations on being the winner of the GCU Blog Carnival and I'll see you there! Your Happyville Dog card is awesome! Hi Peggy! I love your store! All the cards are so prettyt and colorful. Keep up the good work! Love the expressions you capture. your love for dogs really shines through. I'm especially partial to the pugs. I am a HUGE fan of your store Peggy, being a dog lover and all! I sat, I sniffed, I wagged and loved it! Peggy, I can't think of anything better than a card store dedicated to dogs! Your designs are wonderful and so much fun! what a great shop - Bravo to you ! I just wanted to tell you that the card I bought from you arrived the other day and it is gorgeous! I am so impressed by the quality of the card. Love your shop, so I just bought a card! What darling, darling images!!!! Beautifully photographed!!! what a great collection of DOGS...their personality really come thru. Great pics of hard to capture subjects. The only problem is that I don't see my sweetie-pie (my dog Chong) up there BUT, for those who are looking for that special dogie card, this is the place! Your pictures are wonderful, I don't know how you get the doggies to behave :), our cat only does three things and two of those you would not want to watch.. wonderful cards, perhaps you can do some papillon ones, you never see them, and they are soooo cute. People are going to adore these. From someone who dearly loves all animals and especially dogs, I just adore your collection of precious images.